If ever there was a wedding with a wow factor, this was it. For a start, the story of how Emma and Steve got together was the stuff of Hollywood films. Whilst visiting a friend in the cathedral precincts in December two years ago, the doorbell rang and when Emma answered the door, her life changed for ever. A very handsome and friendly man stood on the other side of the door and that’s when the lightning bolt struck! That Friday, they had their first date and they never looked back. Steve proposed the following January, just a year after they first met. So romantic! The next ‘wow’ was the wedding venue. 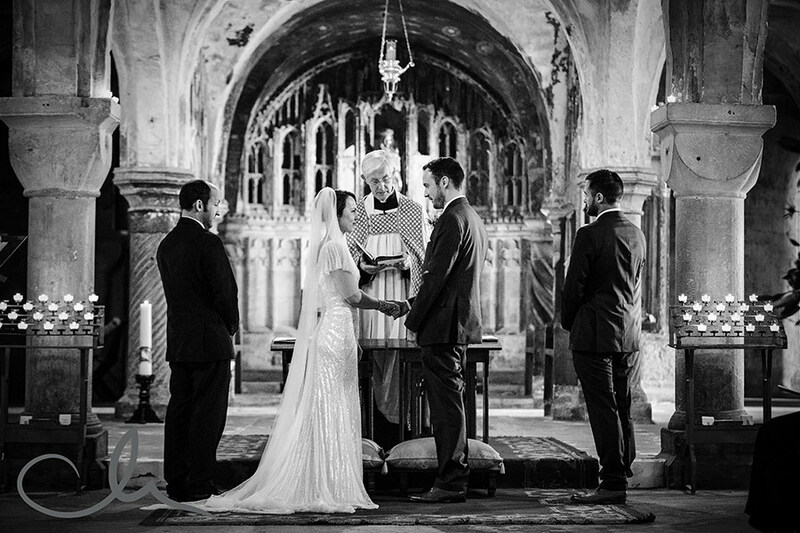 Amazingly, Emma and Steve were able to get permission to have their wedding at Canterbury Cathedral, where they had first met, and the ceremony took place in the Crypt this October. I met up with Steve and his friends in a pub just around the corner from the cathedral before they made their way to the wedding itself. Canterbury is such a beautiful place, packed with medieval half-timbered buildings and flint stone walls, the city and cathedral grounds provided us with a wonderful backdrop for these shots. Emma’s arrival was sensational. Her dress, chosen from the Eliza Jane Howell collection at Isabella Grace, oozed glamour and sophistication from the golden age of couture – Emma looked like she had just stepped out of an episode of Downton Abbey! 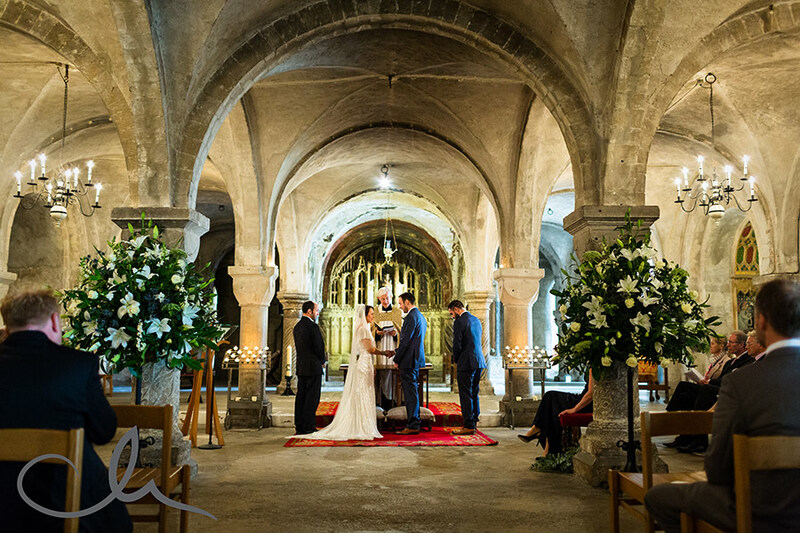 The ceremony was held in the cathedral crypt – a truly sensational venue. The architecture is simply stunning, and the candlight and low vaulted ceilings created an intimate place within the context of the immense cathedral. The soft glow from the candles bounced from the contours of the arches, providing beautiful interplays of light and shadow which were a joy to capture on film. As if that wasn’t enough, after the ceremony I took Emma and Steve to the cloisters for some posed portrait shots. This setting was so atmospheri, and one of my favourite image of the day has to be one of Emma and Steve standing at the edge of the cloisters, with light washing over them and deep shadow behind. A final snatched moment in the cathedral gardens, as the golden autumn sun was shimmering through the foliage, gave me the chance to create a sparkling soft focus backdrop, mirroring the sequins in Emma’s dress. I left the couple and their guests on their way to the wedding breakfast in a vintage bus – a great chance to take some photographs of the guests in a more informal setting. What an amazing experience. Thank you so much Emma and Steve for allowing me to join you at such a special location!